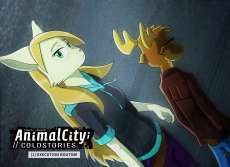 An interesting visual novel about a conspiracy and web security. Three childhood friends, who entered in the same university, ZNU, known for the specially alternative ideals and teaching methods, are enjoying their now long started college life. By outside influences, they discover a computer program that can surpass any online security to obtain private files, from anywhere. But not everything works as expected, and the program goes haywire, spreading itself and giving away personal, corporate and/or vital information to anyone at random. In a despicable society where information is power, such a powerful tool could destroy economics, politics and cultures, as well as international exchange. Given this new state of the world, given this chance of world change, should they destroy the program from its roots or let it spread out? Destroy or rebuild? Silence or Noise? This story questions the state of society and the implications of one without facades, lies and disinformation. Sadly, it ends in a cliffhanger and the sequel never came to complete the storyline.